Take a look at Irish Princess Designs "Gardenia kit" Filled with 60 elements of whimsical fun, and 10 beautiful papers. Here's what I did with her amazing kit, and for you a tutorial. From there choose any mask you want or choose the one I used with a circular pattern. Next it will pop another option for you, you want to look for "Merge"--> "merge group". Tada you have a masked layer. Open- IPD_G_Arch, re-size it to 45%. Now lay your grass elements down, and your tree behind your top grass layer, and place swing under your tree. Grab your arch, decorate it with the flowers, and the furniture elements. Grab your bench, decorate around it with the flowers, the book, umbrella, and pillows. For mine I took the vine placed it into the book to give it a whimsical look. See my signature for example. 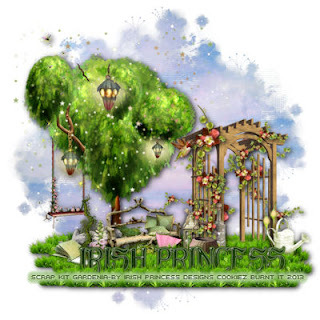 Now Add copyrights to the scrap kit you’re using, I am using Irish Princess Designs, Gardenia kit, if you choose to use the same elements in my tutorial, please purchase her Gardenia kit.